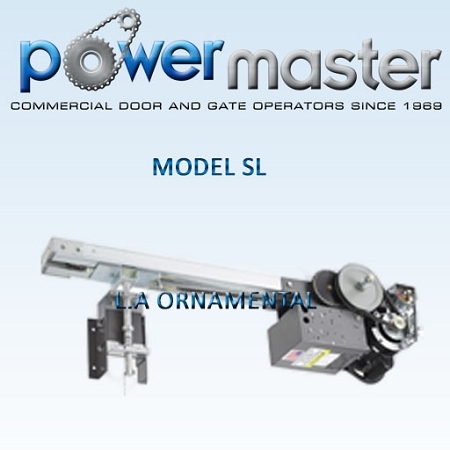 Supply PowerMaster Model SL-72 Slide Door Operator(s) RATED 3/4 HP, 230/208 VOLTS, 1 PHASE, for use on Sliding Doors. Primary reduction shall be by heavy duty V-Belt Drive. Secondary reduction shall be a chain and sprocket arrangement. Motor shall be continuous duty industrial type protected from overload by a current sensing or thermal type overload device. 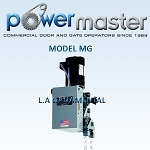 Motor shall be of the high starting torque, continuous duty industrial type, protected from overload by a current sensing or thermal type overload device. Motor controller shall be a heavy duty, full voltage, across the line, magnetic reversing contactor, that is mechanically and electrically interlocked. 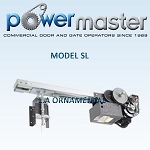 Electrical components shall be installed in a NEMA 1 enclosure integral to the operator. A transformer shall be provided to reduce control voltage to 24 VAC. Separate terminal strips shall be provided for connection of power supply line and all control devices.